You do not state what soil your trees will grow in, or in a heavy rainfall zone or if in a frost pocket? Ian Sturrock of Bangor North Wales has Welsh Heritage fruit trees, most of which will grow anywhere in the North West and are very reasonably priced. Look on his web site. The Snowdon Pear and Denbigh Plum I would personally recommend. My Denbigh plum is in flower now and has more blossom on than any other of my plum trees and is tough as old boots and an excellent pollinator. However, it is not self-fertile as Ian advertises but only part fertile so needs a pollinator, I use Marjorie’s Seedling and Opal, two other plums I would recommend for the North. Scrumptious, Lord Derby and Howgate Wonder apples do quite well here as well; they’re growing in heavy (but well drained) clay. Surprisingly the two best performing pears for me besides the Snowdon pear are Doyenné du Comice and Beth, a lot better than the Conference pear; worst of all by far is Williams’ Bon Chrétien which is a martyr to scab, canker and pear midge here in North Wales. A neighbour has a large mature Winter Nélis pear tree which is not very successful except as a pollinator for the Concorde pear tree which does like growing here, if that’s any help. Take a look at PTES.org/FruitFinder for listings of fruit by county or region plus where to buy them. In high rainfall areas it is important to test the soil for the pH as rainfall is on average 4.9. This advice applies even over limestone. The wisest course for anyone starting a new orchard is to apply lime to the ground before planting. A member of the North Cumbria Orchard Group, who lives in Cockermouth and who has been very successful with apple varieties such as Fiesta, which tends to get scab badly, had his field partly ploughed and put lime chippings in the plough lines. It is best to use this list with either a catalogue from a firm such as Rogers of Pickering, which gives more description or to look at their fruit list on-line. Also see Deacons Nursery on-line or Adams Apples. Unfortunately it is not easy to describe a taste of an apple so a visit to an Apple Day where one can taste the apples can be useful. However, many very early apples are soft and light and do not keep. One uses them or eats them straight away. Dessert apples Irish Peach and Beauty of Bath fall into this category as does the cooker Keswick Codlin. By comparison such apples as Bramley’s Seedling and Dumelows Seedling are hard, dense and do not bruise and will keep for use in the spring. Dessert apples such as Duke of Devonshire are intended to be kept and eaten after Christmas. All apples get sweeter with keeping and this makes some cookers quite edible in the New Year. * Stars indicate the variety is known to be resistant to scab, which is the fungal disease that causes black spots on the leaves and fruit. This is troublesome in high rainfall areas. Dressing the soil with lime to lower the acidity level helps as does removing the leaves and burning them. The fungus overwinters on leaves and diseased fruit. Beauty of Bath and Irish Peach are early soft apples, which are found in many old orchards and have stood the test of time. A small tree provides apples for children to pick. *George Cave: a red and green round- conical apple raised in Essex 1923. Crisp but fruit soon drops. *Katya (Katy): an oval red flushed apple, originally from Sweden. Available commercially; raised in 1947. 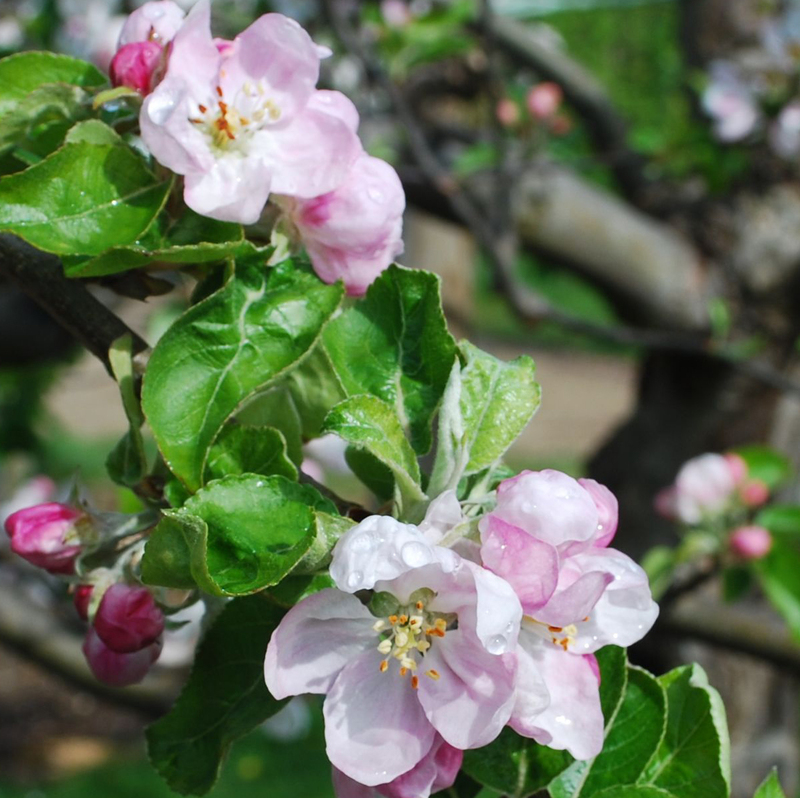 A hardy apple and recommended as a good pollinator. by organic growers. Raised in 1949. Blossom said to tolerate frost. Gravenstein: a triploid which is a heritage apple and surprisingly crunchy like a modern apple. *Laxton’s Epicure: round yellow and red striped early apple, commercially available, raised in 1909 by Laxton Brothers of Bedford. Trees said to be hardy with some resistance to frost. *Laxton’s Fortune: a mid season apple raise in 1904, commercially available. Hardy trees but prone to canker in very wet situations. St Edmund’s Pippin: raised in 1870. The earliest russet and much better than Egremont Russet in the North West. *Red Devil: a modern disease resistant red apple known to grow in the fells near Cartmel, Cumbria. Lord Lambourne: a commercially available red green crisp apple raised in 1907 by the famous Laxton Brothers Nursery and suitable for most of Cumbria. *Bradleys Beauty: local Cumbrian apple. Found on the mosses at Witherslack by Mr Robert Bradley, Cumbria. Defies the wet conditions. An oval dual-purpose apple and a very strong grower. *Cockpit Improved: dual purpose. A good old Yorkshire apple with skin that feels like leather. *Norfolk Royal: grown at Appleby, Cumbria. A good, scab-free apple. Jupiter: a large conical red striped modern apple with a good flavour; does well as a late summer/autumn apple. *Ribston Pippin: red striped apple raised from a seed brought from Rouen in France to Knaresborough, Yorkshire in 1688. Highest content of vitamin C of any apple. Very good flavour. Parent of Cox’s Orange Pippin. A strong growing triploid variety. Proctors Seedling: recommended by Mr. Rainford, north-west representative of the Northern Fruit group. A round red striped apple much grown in north Lancashire. Green Balsam: plain green Yorkshire apple which came top in tasting trials at Sizergh (Cumbria) Apple Day some years ago. Adams Pearmain: good tasting, long keeping, disease resistant apple. Duke of Devonshire: a green apple with some russet. It came from Holker Hall (Cumbria) and was raised by the head gardener. *Lord Grosvenor: an early green-yellow apple. Grows in the Lune Gorge in Westmorland. Royal George: a huge yellow Lancashire apple, which can weigh over a pound. *Royal Jubilee: a disease free cooking apple. Recommended for frost pockets. Keswick Codlin: a well known Victorian favourite. Yellow, early cooking apple. Grenadier: a large round-conical early cooker. Very good for baking. *Autumn Harvest: a green apple, that was once grown in every Westmorland orchard. Wheaten Loaves: a pale yellow cooking apple from Whitebeck orchard in the Lythe Valley. *Greenups Pippin /Yorkshire Beauty: raised by a shoemaker Mr. Greenup who lived in Keswick, Cumbria. Yellow with a red flush. Lord Derby: popular autumn cooker, commercially available. *Burr Knot: a plain apple but its branches bear burrs, which will grow into roots enabling cuttings to be taken. Grows in the Lune Valley in the Cumbrian Fells. *Taylors Favourite: local apple, from Whitebeck Orchard, in the Lythe Valley, a red striped strong growing cooking apple. Tower of Glamis: a reliable green cooking apple from Scotland. Less acidity then a Bramley, but good disease resistance. Tom Putt: strong growing bright red cooking or cider apple. *Lanes Prince Albert: late keeping cooking apple green with red stripes and a very good cooking apple for the north. *Scotch Bridget: conical, red/green cooker with prominent ribs. Favourite in Cumbria and North Lancashire. Very good keeper and in a warm season pleasant to eat. *Newton Wonder: well known red striped apple and good keeper. *Cockpit: a Yorkshire apple. Green cooker with tough glossy skin and very disease resistant. *Edward V11: a round green late apple recommended for the north. Scab resistant. **Bardsey: a new apple from the island of Bardsey, which is said to be very disease resistant and is now growing in the Lune Gorge successfully. Fillingham Pippin: there are also several burr knot apples including Fillingham Pippin, which survive well. Burr knots grow preliminary roots on their branches and will take from cuttings. Most are cookers, but Fillingham Pippin is a dual purpose apple. Nancy Crow: this is an exceptional apple found at Staveley near Windermere. It is a burr knot and takes from cuttings. It has thick hairy leaves and a yellow apple like a Keswick Codlin. It grew in the bottom of the Lune Gorge in Cumbria in a dense un-pruned bush without any disease. Grafts have been taken recently for future sale at the National Trust property, Acornbank, near Penrith. Plums stand a high rainfall better than apples but Czar and Early Rivers Prolific are recommended for the North, both are black plums but Early Laxton is a yellow plum and recommended by Henry Noblet. Victoria is suitable as a dessert but many of the other plums and gages will succeed if they do not need too long a season. Greengage is one of the oldest fruits in cultivation. It came from Armenia and was known as Verdochia in Italy and Reine Claude in France, taking this name from the wife of Francis 1st (1498-1547). When the fruit was sent by a Mr Gage from Paris to his brother in England the label was lost and it became Greengage. Oulins Golden Gage is a seedling, which produces bigger crops than the original Gage. Damsons succeed in very difficult areas and were often used to shelter other fruit trees, as were bullaces. Many pears need a long season and sunny situation to reach their best. The hardiest northern pear is Hessle/Hessel but Conference is successful and modern pears such as Beth and Concord are also good. We are in the Peak District so maybe roughly comparable. Certainly it can be wet and cold at difficult moments. As far as productivity and health goes (and to some extent quality too) it really does seem to be horses for very specific courses. After moving just a few miles around the hill we found that some varieties which did very well in our previous garden did poorly here, and others which had been disappointing there did very well indeed. Yet we are the same altitude as before, similar drainage profile, and some of the soil (which varies a lot) is very similar. I suspect the only way to really find out what will do well in a specific place is to experiment. If they are happy with you Orleans Reinette, Ashmeads’s Kernel, and King of the Pippins live up to their reputations – to my personal taste, that is. KoP in particular lasts very well in natural storage and is genuinely dual purpose. My partner would rate Margil. Ribston beats Cox’s hollow for flavour (IMHO) but doesn’t like it here; neither does James Greave which was a banker in the old garden a mile or two away. For sheer miniature beauty on a grey day a treeful of Pitmaston Pineapple takes some beating, and the flavour in a good season is gorgeous – in other years sometimes not so good. Plums I’ve very limited experience but Coe’s Golden Drop is up there with a good Greengage for flavour.